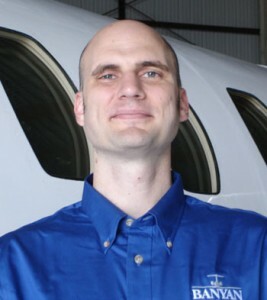 George Tucker recently joined Banyan Air Service as the Director of Banyan Pilot Shop. He is responsible for the leadership and growth of the Pilot Shop and banyanpilotshop.com including marketing strategy, supply chain, inventory and management. “We are excited that George has joined the Banyan team. Given his extensive background in e-commerce and on-line marketing, we anticipate that he will increase our market share through new relationships and increase revenue streams,” says Don Campion, President of Banyan Air Service. George previously worked at Envisia Group for seven years promoting health and beauty products and has managed advertising budgets in excel of $1.5 million annually. Before Envisia, he was a copywriter at MLA Consult Inc. George earned a Master’s degree in creative writing from Florida International University and has taught college composition courses. He is an accomplished fiction writer, has won multiple national awards and was nominated for an American literary prize by Pushcart Press. “I’m thrilled to put my skills to work in the aviation industry. Very few niches are as technologically advanced as aviation electronics. What’s even more thrilling is that banyanpilotshop.com offers the same great products as our physical store, but on a global level,” says Tucker. Banyan Pilot Shop is located at Fort Lauderdale Executive Airport and is one of the largest aviation stores in the nation. It offers pilot supplies, a large selection of headsets, safety gear, training materials, charts, apparel, children’s items, radio controlled aircraft, and everything a pilot or aviation enthusiast needs or wants. The store also features a Gulfstream II fuselage equipped with flight simulator software and an electronic tower featuring a wide variety of portable aviation electronics. The store is open seven days a week. For more information, visit www.banyanair.com/pilotshop.